Chinese man-tended space laboratory. A series of three of these laboratories were to visited by a series of Shenzhou manned spacecraft between 2011 and 2018. The 8.6-ton design was also the basis for the 13-ton cargo carrier for resupply of both Tiangong and the Chinese multi-module space station after 2020. AKA: Project 921-2. Status: Operational 2011. First Launch: 2011-09-29. Last Launch: 2011-09-29. Number: 1 . Gross mass: 8,600 kg (18,900 lb). Height: 9.00 m (29.50 ft). Diameter: 3.35 m (10.99 ft). Span: 23.00 m (75.00 ft). China began preliminary work on advanced manned spaceflight in July 1985. The decision came against a background of vigorous international space activity. The United States had its Strategic Defense Initiative and Space Station Freedom. The Soviet Union had its Buran shuttle system, Mir and Mir-2 space stations, and its own star wars program. Europe was developing the Hermes manned spaceplane, and Japan the Hope winged spacecraft. Even India and China were taking on ambitious space projects. It seemed China would have to take action to remain a world power. Work began immediately on defining the 863-204 shuttle spacecraft. The final 863-204 Expert Commission report in July 1989 advocated building a manned capsule, with a first flight date of 2000. This would satisfy the leadership's desire for an early Chinese manned space capability, and establish the essential earthly infrastructure and spacecraft subsystems technology for more advanced systems. However in parallel development of technology for a two-stage-two-orbit horizontal takeoff and landing reusable space shuttle would be pursued, with a first flight date of 2015. Phase 1 would involve launch of 2 unmanned versions of the manned spacecraft, followed by the first Chinese manned spaceflight, by 2002. Phase 2 would run through 2007, and involve a series of flights to prove the technology, conduct rendezvous and docking operations in orbit, and operate an 8-metric ton spacelab using the basic spacecraft technology. 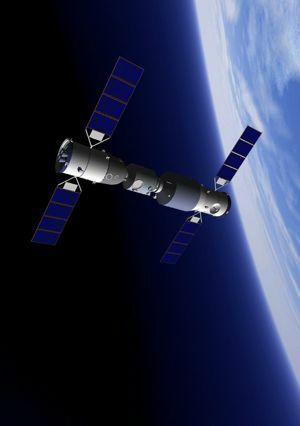 Phase 3 would involve orbiting of a 20-metric ton space station in the 2010-2015 period, with crews being shuttled to it using the 8-metric ton manned spacecraft. The final plan was approved on 21 September 1992, and Project 921 to create a Chinese manned space capability began in earnest. $ 2.3 billion was spent in 1992-2003 creating the Shenzhou manned spacecraft and the infrastructure to support it. Authorization to proceed with the space station finally came in February 1999, with the first design review in May. This involved design of both the 8-metric ton and 20-metric ton versions of the station. A vacuum chamber with a diameter of 7 meters and a height of 12 meters had already been built to test the station. A node module, about 3 m long and 2.2 m in diameter, equipped with six docking ports. Attached to two of them were large rotating solar panels (following the same principle as those on the Shenzhou). At either end of the node, two long (8 to 10 m x 2.2 to 3.0 m) modules, each equipped with ten docking ports. Attached to these were what appeared to be an airlock or resupply module, a propulsion module, and a two-beam truss with parabolic antennae. Overall length of the relatively modest station would be about 20 m, with a total mass of under 40 metric tons. However the large number of unused docking ports indicated substantial room for expansion. In February 2001 it was decided to proceed with development of a next generation of modern Chinese launch vehicles. These were to begin flying in 2008, and would be used for launch of the larger 20 metric ton station modules of up to 5 m diameter. In June 2001 it was revealed publicly that China would implement its Project 921 space program in three phases. 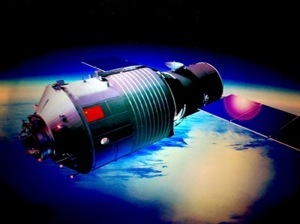 Wang Yongzhi, the chief manned spaceflight engineer and designer, told a conference held in Beijing that the first phase would be consist of the Shenzhou - launch of single manned spacecraft over a series of unmanned and manned flights, demonstrating flight of Chinese astronauts in near-Earth orbit and their safe return to earth. In orbit the astronauts would conduct earth observations and space experiments. In the second phase spacewalks, rendezvous and docking tests would be conducted. A space laboratory would be orbited, but only man-tended on a short-term basis and left in an automated mode between visits. The third phase would involve the launch of a larger space laboratory. This would be permanently manned and be China's first true space station. In March 2002 it was announced that the permanent space station would have a launch mass of 20 metric tons, and be launched by the next generation rocket series. Later that year it was indicated that the launch of this 20 metric ton station would come no earlier than 2010, and possibly as much as 15 years later! In December 2002 it was revealed that work had been underway on a robot arm for use on the station. A 20% scale model represented the fifth generation of prototypes of such arms built by Research Institute 502, the Beijing Institute of Control Engineering. In February 2003 the Chinese released a picture of a mock-up of their 'Space Laboratory'. This was to be orbited no earlier than 2010 by the largest member of their next generation launch vehicle family. The 20 metric ton Space Laboratory consisted of a larger diameter module (4 to 5 m in diameter) with a single Russian APAS-style universal docking collar on the forward end. The aft smaller-diameter module was equipped with a large folding solar array. The larger module had portholes at the docking end, thrusters arranged about the outer surface, and was covered with white thermal blankets. It seemed to be designed, at least initially, for operation by a crew delivered by a single Shenzhou spacecraft, like the early Soviet Salyut space stations. Thereafter, mention of the space station virtually disappeared from Chinese public statements. 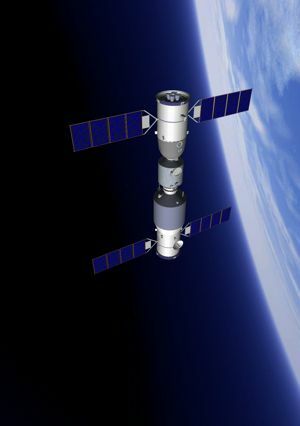 In February 2004 it was announced that the first 8 metric ton space station would be launched only after Shenzhou 6, 7, and 8 had proven the basic spacecraft's rendezvous and docking capabilities. Launch of the 20-metric ton station would occur after 2010. At the Zhuhai Air Show in November 2006, a new model of the station was displayed, docked to a Shenzhou spacecraft, which allowed it to be scaled. It now appeared very similar to the early Salyut space stations orbited by the Soviet Union in the 1970's. Continued delays in the New Generation launch vehicle series pushed first flight well past 2012. 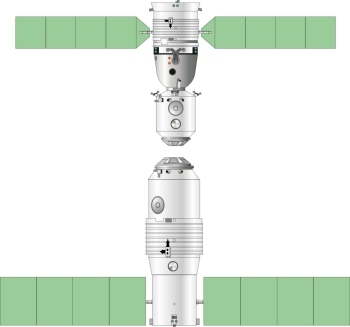 As of 2007 it was announced that Shenzhou 8 and 9 would dock with a station of this configuration, equipped with two docking ports, and launched in 2010. They would then be followed by the manned Shenzhou 10, which would presumably operate the station for a brief period. Then there would be another multi-year delay, with another small man-tended space station being launched in 2012. The station would probably consist of versions of the Shenzhou service and orbital modules modified for the specific mission. The 20-metric ton space laboratory seems to have been delayed to 2015 or beyond. By 2010 the plan was for a total of three Tianqongs to be launched, in 2011, 2015, and 2020. 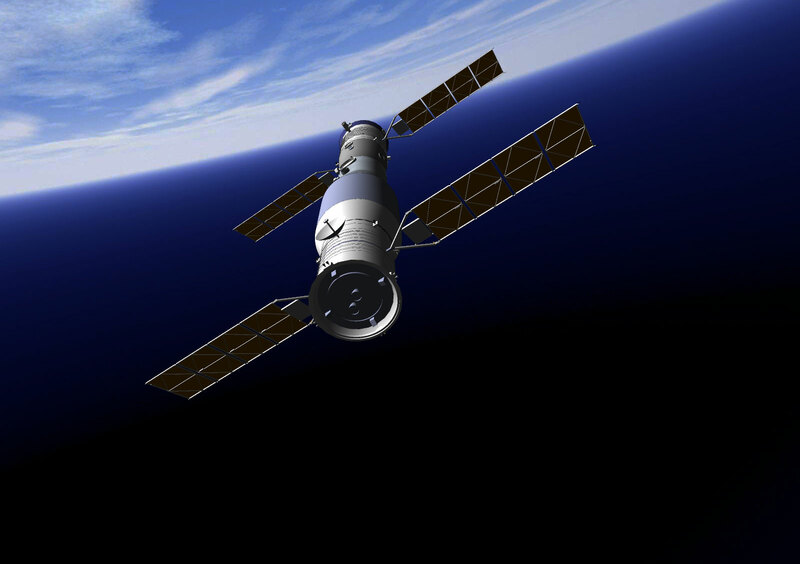 Each was to be visited by three Shenzhou spacecraft (the first two to Tiangong-1 unmanned). Crew dwell times would progressively increase from a week, to 20 days, to 40 days. The design would be the basis for the Tianzhou unmanned cargo carrier to support the future multi-module Chinese space station (to be completed in 2020). In that role total mass would increase from 8.5 to 13 metric tons and require use of the CZ-7 new-generation launch vehicle. 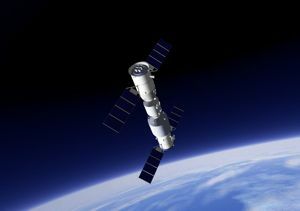 In the event, the first 8.6 metric ton space laboratory, Tiangong-1, was launched in September 2011. The unmanned Shenzhou 8 docked with it a month later, followed by 7 and 10 day manned missions to the station by Shenzhou 9 and 10 in 2012 and 2013. The second Tiangong was launched in September 2016, followed by a 30-day mission by the Shenzhou 11 crew. The first 13 metric ton Tianzhou resupply spacecraft, launched on the second flight of the CZ-7, docked with Tiangong-2 in 2017. Tiangong was not a true space station but rather a man-tended facility. On-board experiments were operated continuously, and about one Shenzhou flight per year docked with the station to change out experiment payloads and results, and conduct repairs. The orbital module's habitable volume was quite small, 70% that of the American Manned Orbiting Laboratory of the 1960's and less than one tenth that of the Almaz and Salyut Russian stations of the 1970's. When used for Tianqong (without the need for the launch escape system for Shenzhou), the CZ-2F booster payload increases from 7.8 to 8.6 metric tons, which defined the spacecraft's gross mass. Tiangong was encased in a large, orange-brown clamshell fairing until the booster is clear of the atmosphere. The aft service module, providing electrical, environmental control, and propulsion services. This was a cylinder, about 2.5 m in diameter and 3.3 m long, probably a modification of the Shenzhou service module. 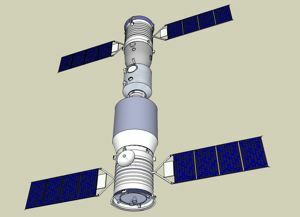 Tiangong had a different propulsion scheme than Shenzhou, with two small high-expansion-ration main engines (versus four larger engines for Shenzhou). Four sets of two small aft-firing engines at the base provide vernier thrust for fine maneuvers (versus four sets of canted engines for pitch, yaw, and vernier maneuvers on Shenzhou). Pitch, and yaw control was via four sets of two small engines mounted around the external base of the module (as on Shenzhou). Location of roll control thrusters was unclear, but apparently in the pods for the other thrusters at the base. The unified propulsion system of the service module fed both attitude control and main engines from four 230-litre-capacity propellant tanks loaded with up to 1,000 kg of N2O4/MMH propellants. The engines were pressure fed using six 20-litre titanium cold gas tanks pressurized to 23 Mpa. This gas was used to force propellant at 2 Mpa using diaphragms within the propellant tanks. Two four-panel solar wings, with a total span of about 23 m, deploy from the sides of the service module. These could be rotated to obtain maximum solar insolation regardless of spacecraft attitude. Each wing, about 3.1 m x 10 m, provided about double the electrical power of the Shenzhou system (total about 7 kW peak, 2.5 kW average). The back surface filled silicon solar cells of the arrays had an efficiency of 14.8% on Shenzhou. Sun sensors between the panels measured the sunlight incidence angle which allowed the panels to be automatically commanded to an optimum angle. Silver-zinc batteries in the service module provided emergency power in case of failure of the solar arrays. 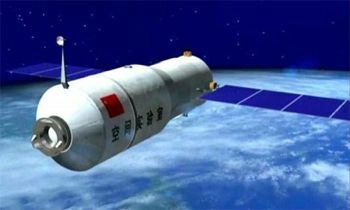 The spacecraft's power bus operated at 28 V.
The Tianqong service module lacked the flared base of Shenzhou, and was longer. The external radiator surface for the spacecraft's thermal regulation system was moved from the service module to the orbital module. Within the service module were several ellipsoid-shaped compartments that housed avionics and electrical system equipment. The transition section, 1.1 m long, flared outward from the 2.5 m diameter of the service module to the 3.35 m of the orbital module. This probably housed the nitrogen and oxygen gases for the environmental control system. These were stored in steel alloy spheres at a pressure of 21 Mpa. Possibly water tanks were also located here. 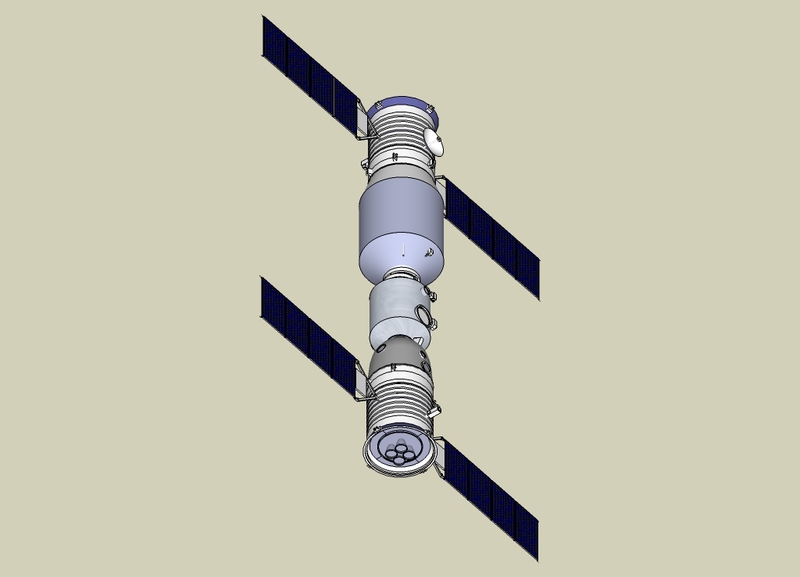 The orbital module, 3.35 m in diameter and 5 m long provided the crew space in orbit. To reject the 2 kW of heat generated by Tiangong's crew and internal systems, a cooling system used heat pipes to conduct heat from internal systems to an external radiator. This surrounded the aft 2.3 m of the orbital module, increasing the diameter here to nearly 3.5 m. It seemed the interior of the module inside the radiator was packed with equipment and experiments, with perhaps a narrow space for crew access. A mockup seemed to indicate that only the forward 2.5 m of the orbital module was free space for the crew, indicating a habitable volume for the entire module of only about 17 cubic meters. At its forward end the orbital module sloped to a 1.4-m-diameter APAS-type universal docking mechanism (as used for Apollo-Soyuz, Shuttle-Mir, and Shuttle-ISS). This indicated the possibility of crew rescue from one Shenzhou to another in case a crew was stranded. 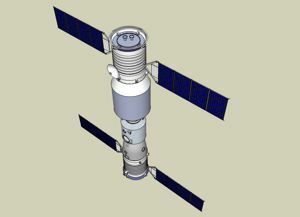 Concepts of a Shenzhou-Tiangong docking showed homing radar towers on each spacecraft as used in the pre-1986 Soyuz 7K-T and Soyuz T. This would indicate that long-range rendezvous operations were carried out by a radar-based system (based on published information or as part of the Soyuz data package delivered to China in the 1990's). Docking operations may use some kind of optical/laser ranging and alignment system. Various devices shown arranged around the docking mechanism are probably for this purpose. Family: Chinese Manned Spacecraft, Logistics spacecraft. Country: China. Launch Vehicles: Chang Zheng 2F, Chang Zheng 2FT1. Launch Sites: Jiuquan, Jiuquan SLS. Bibliography: 2, 424, 425, 460. 2011 September 29 - . 13:16 GMT - . Launch Site: Jiuquan. LV Family: CZ. Launch Vehicle: Chang Zheng 2FT1. Tiangong 1 - . Mass: 8,500 kg (18,700 lb). Nation: China. Class: Manned. Type: Manned space station. Spacecraft Bus: Shenzhou. Spacecraft: Tiangong. Decay Date: 2018-04-02 . USAF Sat Cat: 37820 . COSPAR: 2011-053A. Apogee: 339 km (210 mi). Perigee: 330 km (200 mi). Inclination: 42.80 deg. Period: 91.20 min. 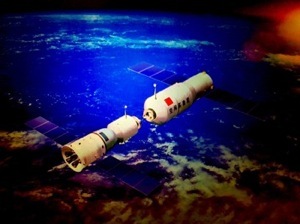 First Chinese manned space laboratory. Placed initially into a 198 km x 332 km x 42.8 deg orbit. Maneuvered to a 336 km x 353 km operational orbit by 30 September in preparation for arrival of the Shenzhou 8 spacecraft that would dock with it. On Mar 21 2016 China announced the end of "data service" with the Tiangong 1. The 8500 kg lab was in a 377 x 394 km x 42.8 deg orbit; it had made reboost manuevers about twice a year, the most recent on 2015 Dec 16. 2016 September 15 - . 14:04 GMT - . Launch Site: Jiuquan. LV Family: CZ. Launch Vehicle: Chang Zheng 2F. Tiangong-2 - . Nation: China. Class: Manned. Type: Manned space laboratory. Spacecraft Bus: Shenzhou. Spacecraft: Tiangong. USAF Sat Cat: 41765 . COSPAR: 2016-057A. Apogee: 389 km (241 mi). Perigee: 379 km (235 mi). Inclination: 42.80 deg. China's second space laboratory was launched on Sep 15. Tiangong 2 had a mass of 8600 kg and was launched into a low perigee orbit by a CZ-2F rocket. On Sep 16 at about 0904 UTC the lab raised its orbit from an initial 197 x 373 km to 369 x 378 km x 42.8 deg; on Sep 26 the lab moved to a 381 x 389 km orbit.